Apple gives us convenient and fantastic life. We believe in our iPhone, iPad, iPod Touch and record our life with them. However, situation occurs by surprise where we lost our precious record of life, like the messages from our love, the contacts important to us or calendar, notes, photos, ect on our iPhone and iPad. If you are facing the predicament, maybe you can try Wondershare Dr.Fone for iOS. 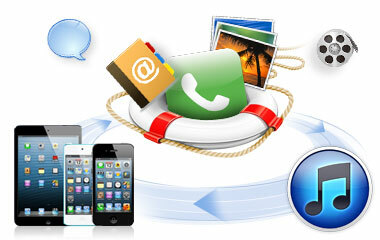 Panicked due to deleting text messages, notes or other data by accident from your iPad, iPod touch or your iPhone? Did you damage or break your iPod touch or iPhone, which had important data on it? Has your data been removed because of a failed update? Get the doctor in. Wondershare Dr. Fone is a user-friendly tool that helps you restore videos, contacts, text messages, notes, call logs and calendars. Even Safari bookmarks get returned to their rightful place on your iDevices. How is that possible? It requires just three easy steps. You can review the files you lost and then recover them just like that. What Can Wondershare Dr.Fone for iOS Give us? Accidentally deleted some important data which are urgently needed for tomorrow’s meeting? Or just upgrade your iOS system or do a factory settings restore before performing a file backup to iTunes or iCloud? Never mind, just plug your iPhone/iPad/iPod touch into your computer and launch the program, you will be able to directly and safely restore lost contacts, messages, photos, videos, note, etc from your iOS devices. Everytime you connect your iOS devices to the computer, iTunes will automatically create a backup for your device. If you iOS devices are lost, stolen or seriously damaged, you still has the opportunity to get back lost or deleted files by extracting the data that you have backed up to iTunes before. Start up the program and click “Recover from iTunes backup file" tab to selectively recover backup files according to its indicated device name and date. If you have an iCloud account and backed up your data before, pick this option to restore lost data. Launch the program, click the “Recover” from iCloud backup file” tab, and then sign in your iCloud account with your Apple ID and password in this software, the program will automatically search backup files and show you a list of backup history, select the data you want based on the indicated device name, date, size, iOS version and iCloud account. Hit the “Download” button to save your selected backup file to local computer. Scan lost data: Connect your iOS devices to the computer, the program will scan your iPhone/iPad/iPod touch or iTunes/iCloud backup to find the lost data. Preview & Search: Preview the data with detailed information to decide the specific items that you wish to recover. Use the search box to the find specific file by typing a keyword. Recover lost data back: check the item you wish to recover and save them with the one click “Recover” button to restore either to computer or device.